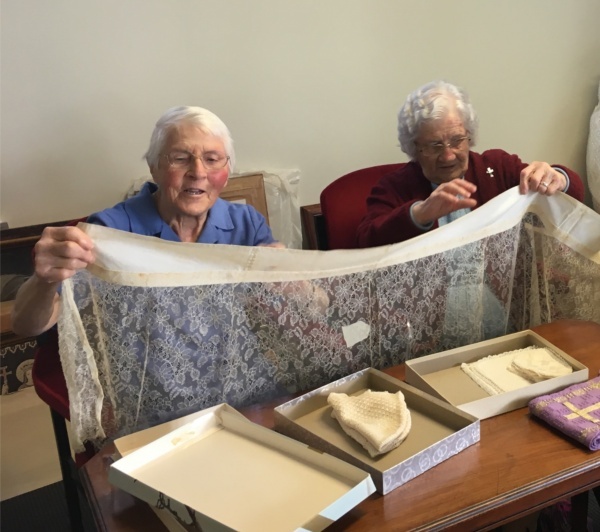 Recently two Sisters of Mercy, Mary Britton and Marie Patrice Lynch visited the site where goods for Adderton: house & heart of mercy are being stored during the renovation of the building. The purpose of the visit was to inspect some Chapel items named as “Rosewood Convent”. As Mary and Marie had lived many years at Rosewood, it was fitting that they be invited to check the provenance of these items. The Sisters were offered hospitality by the Adderton staff who had arranged a temporary table setting on the lower level. Pictured are Alice-Anne Boylan, Britt and Lynda with Sr Marie Patrice and Sr Mary Britton.